The Bhagavad Gita, meaning Song of the Lord (i.e., Lord Krishna), an epic poem of about 700 verses, is part of a larger epic poem known as the Mahabharata. 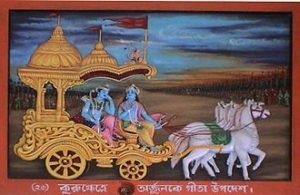 One of the most important texts in the literature and philosophy of India, the Gita arises within the story of an ancient feud over succession in the Kuru Kingdom. Rival factions of royal cousins, the Pandavas and the Kauravas, are met on the Kurukshetra battle field. Arjuna, a champion of the Pandavas, despairs at the prospect of killing his kinsmen and confesses that reluctance to his charioteer and teacher, Krishna. O Pārtha, how can a person who knows that the soul is indestructible, eternal, unborn and immutable kill anyone or cause anyone to kill? O [Arjuna,] descendant of Bharata, he who dwells in the body can never be slain. Therefore you need not grieve for any living being. A first principle of Hinduism gleaned from the Gita: the true self or soul, the essence of an individual, is beyond identification with phenomena.